The origins of the company date back to 1853, when Franz Saurer (1806–1882) from Veringenstadt in Germany established an iron foundry for household goods near the Swiss town of Sankt Gallen. In 1863 he started production of Jacquard sewing machines in Arbon, from 1869 together with his sons as company associates of F. Saurer & Söhne. In 1896 his eldest surviving son Adolph Saurer (1841–1920) took over the company. He and his son Hippolyt (1878–1936) developed the enterprise as a joint-stock company. From 1896 Saurer also manufactured petrol engines and the next year Hippolyt Saurer initiated the production of a phaeton body automobile run by a one-cylinder opposed-piston engine. From 1903 onwards Saurer concentrated on the production of commercial vehicles which soon gained a good reputation. The company ran subsidiary companies in Austria (1906–1959, in the end taken over by Steyr-Daimler-Puch), France (1910–1956, taken over by Unic), the United Kingdom (1927–1931, taken over by Armstrong Whitworth), and in Germany (1915–1918, taken over by MAN). In Italy, the Officine Meccaniche (OM) manufacturer was for many years licensee of Saurer engines and other mechanical units, which they used in their own ranges of trucks and buses. In Poland the state-owned Panstwowe Zaklady Inzynieryjne produced license-built Saurer engines and coach chassis used in the Zawrat bus. 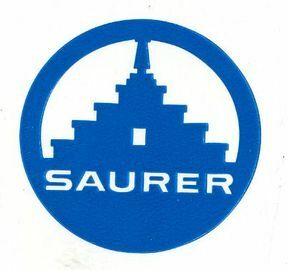 In the United States, the Saurer Motor Truck Company, headed by C.P. Coleman, had the rights to manufacture and sell heavy trucks under the Saurer brand name at its plant in Plainfield, New Jersey. In 1911, the Saurer Motor Truck Company merged with the Mack Brothers Motor Car Company of Allentown, Pennsylvania, to form the International Motor Truck Company (IMTC). IMTC would continue to make and sell trucks using the Saurer name until 1918. In 1922 IMTC would become Mack Trucks, Inc. In 1929 Saurer acquired its Swiss rival, Motorwagenfabrik Berna AG of Olten, but the Berna name was allowed to continue, badging the very same Saurer models. From 1932 on, trolleybuses were a very significant segment of Saurer production. Typically Saurer, or Berna, trolleybuses featured Brown, Boveri & Cie or Société Anonyme des Ateliers de Sécheron (SAAS) electric equipment and Carrosserie Hess bodies. Saurer trolleybuses operated in most of Central Europe countries. Declining sales in the early 1980s saw the two leading Swiss truck makers, Saurer and FBW, forming a joint organization called Nutzfahrzeuggesellschaft Arbon & Wetzikon, proceeding with motorbus and trolleybus production under the NAW brand, while the last Saurer-badged truck sold in the open market was delivered in 1983. Four years later, in 1987, a model 10DM supplied to the Swiss Army meant the very last Saurer truck produced in history.